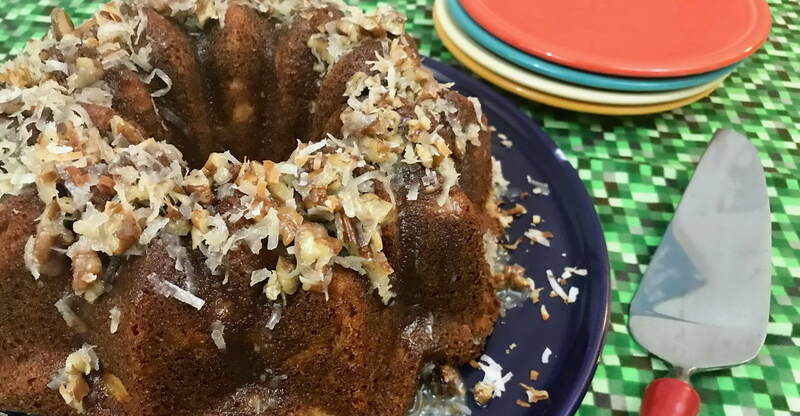 Our Cajun Cake is a tasty, light-textured cake that combines the distinctive sweetness of pineapple with the textures and flavors of coconut and pecans. Serve this festive cake with whipped cream and crushed pineapple. Preheat oven to 350°F. Grease and flour a 10-inch tube or Bundt pan. Drain the pineapple, reserving 1/2 cup juice. Set aside. Cream the 1/2 cup butter at high speed of an electric mixer. Lower speed to medium, and gradually add 1-1/2 cups sugar, beating well. Add eggs, one at a time, beating well after each addition. Combine flour, baking powder, baking soda and salt. Add to creamed mixture alternately with reserved pineapple juice, beginning and ending with flour mixture. Mix just until blended after each addition. Stir in crushed pineapple. Pour batter into prepared pan, and bake for 50 to 55 minutes or until a wooden pick inserted in center comes out clean. Cool in pan 10 minutes, then remove and place on serving plate. Combine 1/4 cup butter, 1/2 cup sugar, evaporated milk, coconut and pecans in a small saucepan. Bring to a boil, reduce heat and simmer for 3 minutes. Stir in vanilla extract. Spoon on top of warm cake. Cool. If desired, sprinkle with toasted coconut and garnish with pineapple slices.